Seminary president Jeff Iorg believes that character, and character development, are essential foundations for effective leaders. In The Character of Leadership, he writes about how God ever shapes character in the life of every leader, and in relation, how continual spiritual formation is a process to which every good leader must pay close attention. 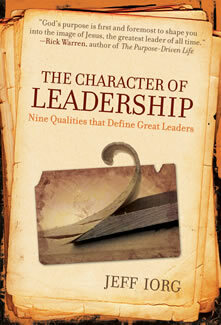 Iorg puts insightful chapter-long emphasis on nine important character-shaping qualities that help readers in “becoming the leader God intends me to be rather than doing the leading God intends me to do.” The nine qualities are: Integrity, Security, Purity, Humility, Servanthood, Wisdom, Discipline, Courage, and Passion.